Bromilow Architects Ltd, Wirral sign up to Architect in the House | bromilow architects ltd.
Local architecture practice Bromilow Architects has signed up to take part in Architect in the House, the joint charitable initiative by the Royal Institute of British Architects (RIBA) and Shelter. 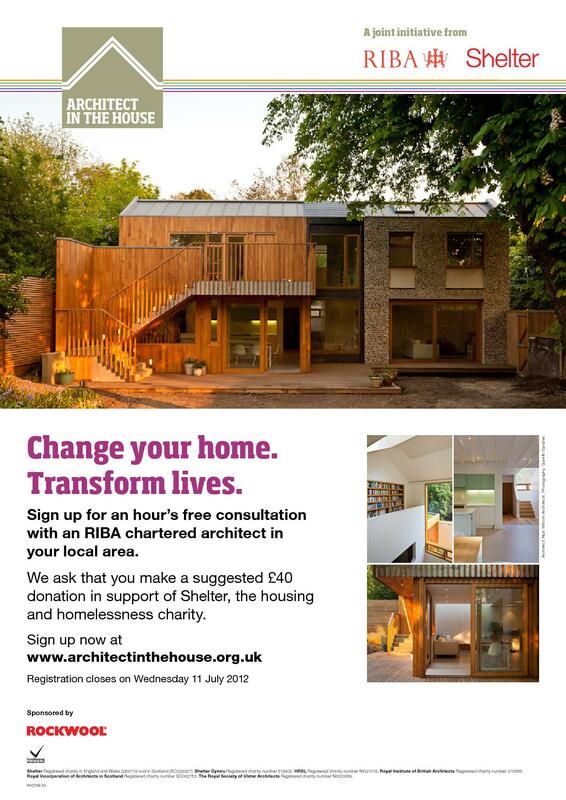 Homeowners can receive an hour consultation with an RIBA chartered architect (such as Stephen or Sally Bromilow) for a suggested donation of £40 to Shelter. Whether it’s inspiration for a study, an extra bedroom, or just better living space you need, a chartered RIBA architect can offer creativity and professional advice that will help bring your ideas to life. Shelter estimates that more than 650,000 households in Britain are overcrowded, affecting over 1 million children in England alone. The donation will go towards Shelter’s work to help all those living in conditions that have a devastating effect on family life and children’s safety, health and education. Homeowners can register for their consultation by visiting www.architectinthehouse.org.uk The project launches officially on 16 April 2012, and matching will take place from May, with homeowners being matched to the local RIBA chartered practices and architects best suited to meet their needs.